My Telementor arrived on a May afternoon in 1999. After a long unsuccessful search in the U.S., I had finally looked elsewhere and had located an OTA in Germany. As I waited the two long weeks for the scope to arrive, I contemplated the dealer's "it's like-new" claim and wondered if this would prove true. Now as I carefully cut through several layers of bubble wrap and tape, I was thinking that the dealer must have wanted the scope to arrive "as claimed", and as it emerged from the cocoon, I knew he was right - not a nick, scratch or smudge. In my hands the "feel" was unlike any other scope I had held; I thought to myself "wow, this is heavy for a 2.5 inch". I tried the unusual focuser -smooth; so out the door I went for a "look-see". My first mount was the railing of my deck and the first target - an electrical transformer on a pole at the end of my driveway, about 300' away. I popped in a 9mm ortho and focused on the cut-out fuse at the top. As I twisted the focus knob, "10 amp" came into view; tack sharp with barely a trace of color in the broad daylight. I couldn't wait till evening. That evening provided only a short period of observing with a quarter moon and high clouds sporting some large holes. Though I don't believe that diffraction patterns will tell the whole story about a scopes optical quality, it seems I am drawn to check them out first, with every new scope. The patterns were excellent, "textbook" on both sides of focus and appeared to be near identical, which was something I had rarely seen in scopes I have examined. I swung the mount over to the moon and at 93X verified the optical quality. The detail surrounding Copernicus was amazing for a 2.5". I added a barlow and at over 70X per inch, the view was still sharp with excellent contrast. I stopped here, time and clouds cut my first night with the Telementor short. Excited, I called it a night; very pleased with the new arrival. I primarily observe from my backyard observatory, located on a 33'-high hill about 200' from the house. I live in the Hiawatha National Forest in the upper peninsula of Michigan, USA and enjoy skies which normally approach 6.0 mag. Of course there are drawbacks to the site - a long, cold and snowy winter, as well as a fair amount of cloudy skies brought on by the surrounding Great Lakes - Superior (about 1 mile to the north) and Michigan (35 mile to the south). However clear nights are very good and a pleasure to experience. Though I often observe and image the moon with my C11, the target of choice for the Telementor has been double stars. And the 2.5 incher has been a worthy competitor, exceeding 80X per inch on nights of excellent seeing. That would be about 900X for my 11" SCT, which is unimaginable. The optical quality of the Zeiss has given me many memorable views over the two years I have owned it. However, interestingly, the most memorable had more to do with the observing location than the scope itself; which says a lot about the portability of a small instrument. The instance took place during the "Olympic Doubles" observing project held by the "Spirit of 33" doubles group on Yahoogroups. The target was Cor Caroli in Canes Venatici. While not difficult under normal circumstances, this was late September and Canes Venatici was setting shortly after nightfall. The only way I would have a chance would be to have a near-flat horizon to the west. I took up position, about 8 miles from my home, in a park along cliffs overlooking Lake Superior. With the waves hitting the rocks 150' below and a horizon kissing the lake, far in the distance, Cor Caroli was an easy challenge for the Telementor. However, enjoying a peaceful sunset among the natural beauty with my trusty Zeiss and nabbing an elusive target at the same time, was the type of observing experience that bonds an observer to his scope. At least, that is what it did for me. As I mentioned before, I was only able to locate a bare OTA when I purchased my Telementor. I have added two Zeiss orthoscopic eyepieces - a 10mm and 16mm. Both have excellent contrast and it is no wonder why these are so hard to find in the States. I have looked for some time and continue to look for a 6mm ortho, but without success. Instead, I normally use one of a full set of Vixen orthos as my primary eyepiece with the Zeiss. I have also investigated getting an original Zeiss mount, but this too has evaded me. I use my Telementor on a Vixen Super Polaris mount, which handles the 7 lb. scope with ease. In fact, the Vixen SP handles my 14 lb. 100mm Zeiss well and I consider it one of the best mid-sized mounts ever made (I have two). For accessories, I own a 2" Zeiss mirror star diagonal and adapters to handle both .965' and 1.25" eyepieces. Even these small Zeiss products exhibit a quality that shows a real pride of workmanship. In fact, everything I have purchased from this company has been of the best quality. My Telementor oozes quality and has been a pleasure to own and I have been very pleased with it. So much so, that I was prompted to search for and acquire a 100mm Zeiss refractor (which is the largest refractor that I would personally own). I have only been able to compare my Telementor to a 3" Unitron that I previously owned. The Unitron brand is highly respected in the U.S. and considered of high quality. For instance, when I recently sold it in order to obtain the 100mm, I received more inquiries concerning it than any other astronomy related item I have ever sold. However, the Telementor in a side-by-side comparison with the Unitron, won in every category - quality of construction, contrast, and sharpness. The Unitron should have better resolution, being slightly larger, but with such a small difference, this was hard for me to determine. The Telementor is still here, the Unitron was sacrificed for his big brother - enough said. I had read about the Telementor over the years and had looked over the ads in the astronomy magazines, but what made me begin my search that resulted in purchasing one, came from a rather unlikely source. I was perusing the Internet one day and came across an humorous site: http://users.vnet.net/heafnerj/foxworthy.html. Among the many jokes were some from a very noted amateur in the U.S. amateur community - Jay Freeman. 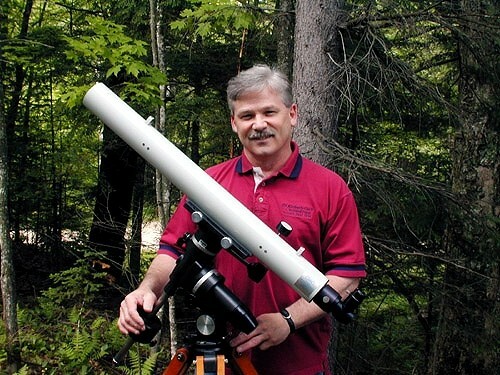 He is a long time observer and a contributor to astronomy publications and Internet sites. Anyway, included in his "one-liners" was: "You know you're a planetary observer if...you actually own a Zeiss Telementor". It was meant to be humorous, of course, but it got me thinking. There had to be something to the reputation and owner loyalty that these small scopes had accumulated over the years and I was going to find out just what it was. "The rest is history".as they say.